Upon illumination of leaves, the yield of fluorescence from chlorophyll decreases from a maximum (P) reached within ls to a steady state (T) several minutes later. During the PT quenching a series of transients are observed, a characteristic induction curve being described as PS1M1S2M2...SnMnT e.g. (Quick & Horton, these proceedings). 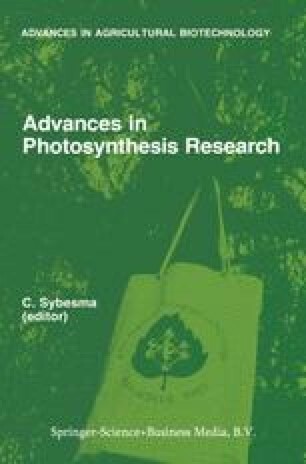 Events occuring during the first few seconds are likely to reflect electron transfer and photophosphorylation only, whereas slower events are increasingly influenced by the onset of photosynthetic carbon assimilation. The yield of fluorescence under physiological conditions is affected by two major quenching processes, the oxidation state of O, (qO) and the trans-thylakoid ΔpH (qe). Before fluorescence measurement can be used to provide a non-intrusive assay of photosynthesis a clearer understanding is required of the interaction between qO and qe and their relationship to rates of electron transfer, ATP turnover and carbon assimilation. It is the aim of this study to provide in vitro simulation. of the mechanism and resultant fluorescence transients observable in vivo. For this we have used the reconstituted chloroplast system described by Lilley and Walker (1976). This system consists of thylakoids to which are added cofactors such as ferredoxin, ADP and NADP, and a stromal extract.